Union Square Ventures, the New York-based VC firm that has backed Twitter, Foursquare, Etsy, Zynga and many others, has debuted a newly redesigned website today. A VC firm launching a new site isn’t usually big news, but in this case, USV has added an interesting new sharing community that draws comparisons to Y Combinator’s Hacker News. On the front page of the site, you’ll see a Hacker News-like, link-sharing stream (under the category community) which is partly curated and also open to anyone posting a link they think is relevant. USV’s partners, including Fred Wilson, consistently write their opinions about technology and the investment world on their own blogs, but as Wilson explains, this will be a place where their content can be cross-posted. USV is also offering a post bookmarklet, a Chrome extension, and an Android share app; it will be releasing a Firefox extension shortly. In theory, the feature is similar to Hacker News. USV admits that the firm was inspired by Hacker News in developing the new feature. Similar to Hacker News, you can vote, comment and filter the stream. Hacker News is the brainchild of Y Combinator co-founder Paul Graham, and started out as a community for ex-Redditors. 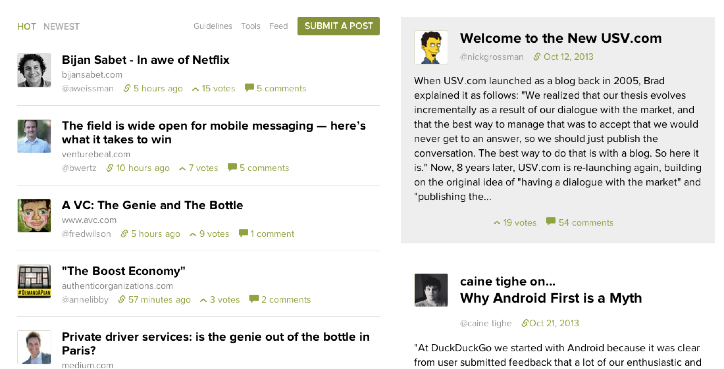 Similar to Graham, USV is attempting to bring together a community on its own site. But while Graham had originally designed the site for hackers and a smaller community (and has grown beyond this after a number of years), it seems as if USV is aiming for something broader at launch. The firm frames the stream as more of a “dialogue with the market.” As Wilson says, “The more the merrier I believe.” Graham has had his concerns with the effects of Hacker News’ steady growth, comparing the site to a crumbling building. Negativity in comments is particularly troubling to him. It’s unclear yet what USV’s community will look like, but we anticipate it will be a mix of founders, fellow investors, engineers, and others in the tech world. The community will likely face some of the additional challenges that Hacker News faces (i.e. flame wars), but Graham has been able to mitigate these challenges using technology and an actual human editor.